I agree that orchids can be planted in regular potting mix, but they will be much happier in orchid potting mix. Orchids are notoriously hard to read and easy to kill–why take the risk? In the event that one of your orchids does begin to suffer, it will be beneficial if you already know how to re-pot orchids. First of all, you have to know if your orchid is even worth saving. You have a chance of bringing your beautiful orchid back to life if there are any leaves or roots left, and if the center of the stem has not become rotten. If this is the case, however, you should just throw the plant away, or use it for mulch. In order to bring back a nearly dead or dying orchid, you will need to re-pot the plant into a nice, very tight pot which will constrain its roots. I must emphasize, use only orchid potting soil, and also use a humidity tray to make your orchid happy again. Be patient with the plant, and remember to water it regularly. If your orchid has already lost its roots, pick up some long plastic twisties or wires. These can be wrapped around the base of the orchid in order to stabilize it just like roots–but remember to anchor the plant firmly into the pot. Three to six of these wires can be bent into place and will stabilize your orchid as it slowly returns to health. Larger orchids have nutrients stored up in their pseudobulbs, canes, and leaves, so they may be able to return to blooming good health more quickly than a smaller one. If your sick orchid was an inexpensive one; however, it may not be worth the years you will have to spend nursing it back to health. 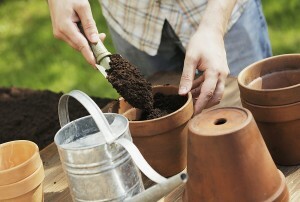 Of course you could always get rid of your inexpensive dirt by using it to re-pot inexpensive plants! Sometimes an orchid’s leaves will begin to turn brown, and then the brown will continue all the way down the stem–remember to keep an orchid’s soil moist by watering it weekly, and to give it good orchid fertilizer every other week. If you’ve been re-potting orchids, the plants may exhibit some amount of stress or decide not to flower, which is normal. Give the plant some time to de-stress, and then look down its flower stem. You will see little nubs, or “pips.” If you trim the tip of one of these, a new flower will form from it. If your plants are exposed to stress or cold, watch them closely for soft spots and rot. Trim any bulbs which develop soft or brown areas. Care for all cuts on your orchids with sulfur or dry fungicide from your nursery, and they might well recover. These tips will help you to keep your orchids healthy, but please remember to treat them with the respect they deserve. They are majestic, special plants, and deserve the extra time and attention–and only the very best potting soil, preferably only that formulated especially for orchids! Otherwise, you will have to learn how to re-pot orchids by heart, because you will continually be trying to nurse your sad, dejected little plants back to health. Do you have any other thoughts about repotting your orchids? If so, please leave a comment below and tell us about it. For more information on exactly how to repot your orchid, see these 7 easy orchid repotting steps. « Can My Orchid Be Saved? do i have to re-pot my orchids after the flowers are dead? what is humidity tray and how does it work? Could you please tell me if I can use the orchid food Miracle grow on a repotted phal I am trying to revive? I live in the west indies and so we have more than enough sunlight but I have a little problem with the watering part, my phals are in the house, two are by a window and the other is on a stand that is not by a window but I think I will have to move that one to the window area, any advice would be helpful thanks. I seem to have an over abundance of roots growing outside the pot. Pots seem to have ample room to allow growth. Some roots are very long, extending below the pot. Having trouble finding info on this subject. I am new at this. plants seem to be growing and are healthy as far as I can tell.Is re potting these plants and tucking the roots inside the pot a course of action I should consider? P.S. Roots are white with green tips.